Two Bears Farm and the Three Cubs: Pass the tiny yellow tomatoes, please! Pass the tiny yellow tomatoes, please! 1. A few years ago my neighbor JP introduced me to these little yellow tomatoes. I fell in love. Smitten with the tiny things. Unfortunately, they cost $3.50 in the store for a tiny container. I think I need to try to grow them in my garden this year. My boys love them too. They are wonderful raw, or roasted on top of pizza! 2. I told my uncle when we met him for lunch in Asheville that Cort was a ham. Cort nodded solemly and said, "Yes, I'm a pig". I forget that kids take things so literally sometimes. 3. Reid helped me plant some onions last month, and he was so delighted when I showed him they are up in the garden. I loved seeing him so excited to be growing food. 4. Thanks to those of you who have asked about the job. It's been going well. I've only been able to work about 6-7 hours a week, due to a conflict in schedule with the time my client wants to meet, and the time I actually have childcare. But aside from that it has been going well and is definitely challenging me, which is good. 5. I broke down and bought myself one of those foam gardening kneeling pads at the dollar store. Somehow I think this makes me less of a gardener. Like I'm less tough now that I have my cushy foam mat? Or maybe I'm just getting old since I need to pad my knees? Then I think, Oh don't be ridiculous, save your knees silly! You aren't less of a gardener, you're a smarter gardener! I grow those tiny tomatoes too they do very well they do so well in fact they grow like a weed and give you tons of tiny tomatoes. I love that. I love my foam knee pad. JDaniel does too. We fuss over who will get to use it. Maybe I need a new one too. Yes!!! Save your knees silly.. They are going to be used for many more years. You should definitely grow some of these 'maters. They look delish. And anything you can do to save your joints/knees is well worth it. Love those little tomatoes -- add them to your garden! I have a foam pad for my knees ... just good sense and makes you look like you really know what you are doing! I never heard one has to be tough to garden . . .
Homegrown veggies are so yummy. How exciting to have onions up already! Saving your knees and back by kneeling on a foam pad DOES NOT make you less of a gardener! Change in small steps is good the adjustment doesn't seem quit so dramatic! Yes, be kind to your knees now. They will thank you later! I'm glad that you're enjoying your job. It sounds challenging, but I know you're up for the challenge! Trust me, save your knees! By chance are those Sun Golds? 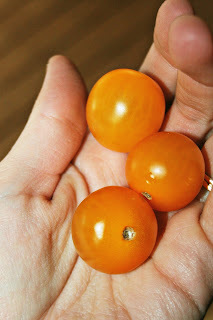 I found a little treasure at our Farmers Market last year -- Sun Gold tomatoes! We're growing four plants of them this year - delicious! The little yellow tomatoes look GREAT... Hubby is the tomato lover in our family. I only like the big summer (home-grown) ones!!!! I love the things kids say! :-) Do whatever you need/can to help your knees. I don't think there is a gardener out there who would begrudge you a little more comfort. They probably all wish they had one, too. Oh yes you'll love those lil tomato's and they grow great so you should have a ton of them! Isn't it so fun to garden with kids, i loved it too. I am glad to hear your job is working out. Save your knees when you can. I tried one of those knee pads I just kept forgetting to move it along with me. I would find myself a couple yards away from the knee pad when my knees started hurting. Hope you have a great day. those foam pads only really stop the mulch, dirt and rocks from implanting themselves into your skin....the kneeling part is still there, so no worries--you are still an official gardener. When I choose veggies to plant I try the more expensive kind. Those tomatoes look like yummy little gems. I have seen these tomatoes large, but not small. The only thing that matters is to take care of your body, remember you need your knees in tip top shape for running. I hope you and your darling little hams have a great weekend! Save your knees and they will save you! Those tomatoes look delish! Love, love, love. I haven't tried the little yellow tomatoes but I probably will have to. They look yummy. your little boys sounds like really "ham" - i think that is the nickname folks give a really funny (joking) type of person. ha. ha!! Your knees will thank you in about twenty years! I love those little tomatoes- and I did grow them one year. They were actually easier to grow than the larger ones. I love little tomatoes! They are good on everything. Glad to hear the job is going well! Working and having a family can be a challenge, so glad to hear it is working out for you. Yes, save those knees! With age we all need to save the knees. I think you did the smart thing by buying the pad for your knees. I mean, why kill yourself, right? Those orange maters are sooo cute! I haven't tried them yet. They sure look good! Thanks for the job update! I didn't want to appear nosy, but I was wondering. I agree with your last statement: save your knees! Hee hee Kids connect the funniest things ham/pig but makes perfect since really ...I remember when I was a kid my Grandmother use to love that Art Linkletter (think that was his name) show Kids say the Darnedest things ... I loved hearing her laugh out loud over what the kids would say. Of course, SAVE your knees. You'll be so happy in later years that you did. I'm glad you like the new job and hope you get as many hours as you want or need. I know you're superb!! A kneeling pad in my opinion makes you a very smart gardener! Glad to hear you are liking your job. Good luck with your garden. Kneeling pad? Not for sissies at all... Some of need a little stool to sit on because kneeling cuts off the circulation in the legs. I bought a tomato plant in a hanging basket on clearance at Lowe's for $3! The tomatoes are so tasty! That suddenly made me hungry for mozarella and tomato pizzaaaaa..